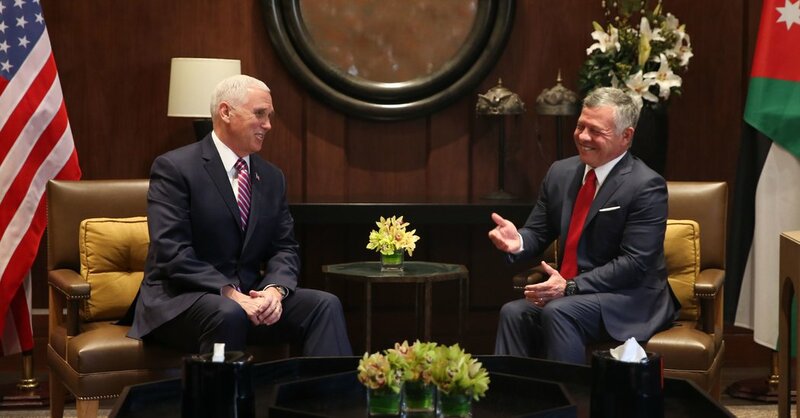 Mr. Pence had delayed his trip to the region amid the furor over Mr. Trump’s decisions, which were seen here as pro-Israel and a slap in the face to Palestinians, and Mahmoud Abbas, the Palestinian Authority president, canceled a meeting with Mr. Pence planned for this trip. The Trump administration said the delay was unrelated to the rising anti-American sentiment in the Middle East. Mr. Pence called Mr. Trump’s recognition of Jerusalem as Israel’s capital “a historic decision,” but insisted that the United States takes “no position on boundaries and final status” issues. Those issues are “subject to negotiation,” he said, according to Petra. He also said that the United States was “committed to continue to respect Jordan’s role” as the custodian of Muslim holy sites in Jerusalem. There have been small but persistent protests in Jordan against Mr. Trump’s announcement last month, and over the weekend a small group of protesters held a sign saying that Mr. Pence was unwelcome in Jordan. The protests led to the closing of roads around the United States Embassy in Amman. “Jordan is a small country surrounded by conflict, and there’s tremendous pressure right now from the population to stand against U.S. and Israeli policies in the region,” said Oraib al-Rantawi, the director of the Quds Center for Political Studies in Jordan. But doing so is a delicate proposition for Jordan’s government, which signed a peace treaty with Israel in 1994 and is heavily dependent on American aid. The United States has provided Jordan with more than $15 billion in economic and military aid since the 1950s. In 2015, the Obama administration and Jordan signed a three-year agreement in which the United States pledged $1 billion annually in foreign assistance, subject to the approval of Congress. But recently there have been signs that Jordan’s role in the region is changing. Saudi Arabia’s strategic shift to align itself with Israel and the Trump administration in recent months, in an effort by all three countries to counter Iran, has diminished Jordan’s role as regional mediator with Israel and power broker in the Israeli-Palestinian peace process. “Now that the regional axis of power is firmly in the Gulf, Jordan simply doesn’t have the strategic importance it used to,” said Sean Yom, an associate professor of political science at Temple University. In another blow to Jordan, the Trump administration announced last week that it would withhold $65 million in aid to the United Nations Relief and Works Agency, which aids Palestinian refugees. Mr. Trump had angrily called American aid to Palestinians worthless after Palestinian leaders said the United States should no longer play a role in peace talks with Israel. The State Department said the funding decision was intended to encourage other countries to increase aid and to promote reform at the relief agency. Unless other countries fill the gap, the reduced funding could have a huge impact on Jordan, which has more than two million registered Palestinian refugees who rely on the agency for education and health services. Several hundred thousand Palestinians live in 10 refugee camps administered by the agency. “The economic situation is already quite bad in Jordan, and Trump’s decision will impact people like us directly,” said Abdul Rahman Qanas, 52, a resident of the Baqaa refugee camp, the largest in Jordan with about 100,000 residents. The refugee agency provides Mr. Qanas with blood pressure medicine every month and routine checkups for his family. All of his children attended the agency’s schools. Mr. Pence is to continue his trip in Israel on Monday.